[S137] Unknown record type, unknown repository address, Illinois, Cook County, Chicago, 45th Ward, Block No. 206; ED # 16-2952, SD # 5, Sheet 4B, Line 90, Dwelling 90, Family 142; Ancestry.com image 04 Jul 2004. [S137] Unknown record type, unknown repository address, Illinois, Cook County, Chicago, 45th Ward, Block No. 206; ED # 16-2952, SD # 5, Sheet 4B, Line 88 & 90, Dwelling 90, Family 142; Ancestry.com image 04 Jul 2004. �����James M. McCarthy was born circa 1944. He was the son of Isabel M. Arndorfer. James M. McCarthy lived at Mukwonago, Wisconsin. He died on 21 August 1955 at University Hospital, Madison, Dane County, Wisconsin. [S88] Unknown subject, Descendancy Chart unknown repository, of Edward TIBBITS from Joel Gericke 02 Jul 2004. [S14] Twelfth Census of the United States, Iowa, Mitchell County, Burr Oak Township; SD # 77, ED #111, Sheet 3A; Image 180; Line 16, Dwelling 45, Family 45; Genealogy.com image 10 July 2004. [S123] Unknown record type, unknown location, unknown record info, Iowa, Floyd County, Rudd: Ancestry.com image, Iowa State Census, 1895 [database on-line], Provo, UT, USA: The Generations Network, Inc., 2003, Original data: Iowa 1895 Iowa State Census, Des Moines, Iowa: State Historical Society of Iowa. [S204] 1905 Ancestry.com image, Iowa, unknown record info, Ancestry.com, Iowa State Census Collection, 1836-1925 [database on-line], Provo, UT, USA: The Generations Network, Inc., 2007, Original data: Microfilm of Iowa State Censuses, 1856, 1885, 1905, 1915, 1925 as well various special censuses from 1836-1897 obtained from the State Historical Society of Iowa via Heritage Quest. [S97] Unknown record type, unknown repository address, Iowa, Cerro Gordo County, Falk Township; SD # 4, ED # 24, Sheet No. 5A, Line 14, Dwelling 92, Family 97; Ancestry. com image 10 July2004. [S97] Unknown record type, unknown repository address, Iowa, Cerro Gordo County, Falk Township; SD # 4, ED # 24, Sheet No. 5A, Line 16, Dwelling 92, Family 97; Ancestry. com image 10 July2004 [Living with family just 2 houses from the household of Arthur S. WETTER where William E. TIBBITS was residing]. 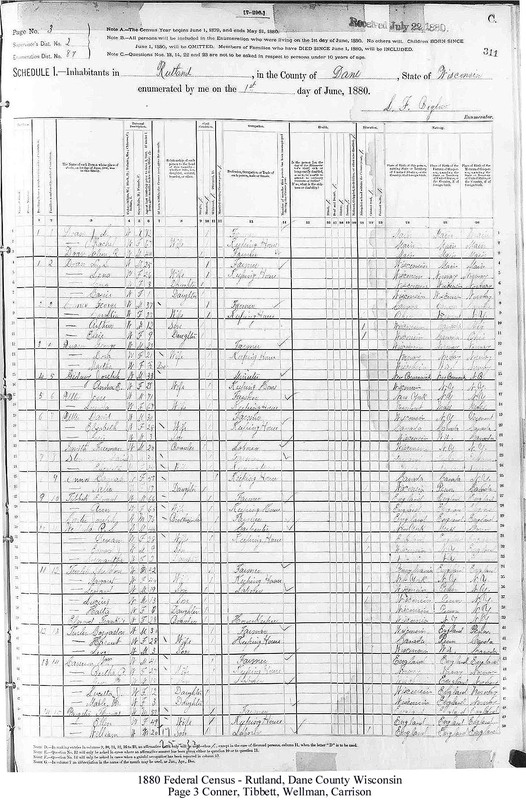 [S137] Unknown record type, unknown repository address, Iowa, Cerro Gordo County, Lincoln Township, ED # 17-17, SD #3, Sheet 5B, Line 97, Dwelling 105, Family 106; Ancestry.com image 10 July 2004. [S137] Unknown record type, unknown repository address, Iowa, Cerro Gordo County, Lincoln Township, ED # 17-17, SD #3, Sheet 6A, Line 2, Dwelling 105, Family 106; Ancestry.com image 10 July 2004. [S2] Death - Obituary, obituary for daughter, Gladys HARBESON TIBBITS - Iowa, Mason City Globe Gazette; July 28, 2006. [S2] Death - Obituary, Iowa, Mason City Globe Gazette; July 28, 2006. [S137] Unknown record type, unknown repository address, Iowa, Cerro Gordo County, Lincoln Township, ED # 17-17, SD #3, Sheet 6A, Line 4, Dwelling 105, Family 106; Ancestry.com image 10 July 2004. [S131] Unknown record type, unknown repository address, InterneTreee: Marvin Cecil Young; 12 Jul 2004. [S76] Unknown record type, unknown repository address, Young & Evans of Iowa; http://awt.ancestry.com/cgi-bin/igm.cgi; 12 Jul 2004. �����Thomas Conner was born on 25 March 1819 at Pennsylvania.1 He married Hannah Johnson.2 Thomas Conner appeared on the census of 26 July 1860 at Town of Rutland, Stoughton, Dane County, Wisconsin; CONNER,Francis: Age 41, Male, Occupation - Farmer, Value of Real Estate $8000, Value of Personal Estate $1200; Born in Pa; Person over 20 years of age who cannot read and write.1 He died circa 19 February 1864. [S9] Unknown record type, unknown repository address, Wisconsin, Dane County, Town of Rutland; Page 137, Image 888, Line 1, Dwelling 980, Family 1017; Ancestry.com image 15 Jul 2004. [S9] Unknown record type, unknown repository address, Wisconsin, Dane County, Town of Rutland; Page 137, Image 888, Line 1 & 2, Dwelling 980, Family 1017; Ancestry.com image 15 Jul 2004. [S9] Unknown record type, unknown repository address, Wisconsin, Dane County, Town of Rutland; Page 137, Image 888, Line 1 & 5, Dwelling 980, Family 1017; Ancestry.com image 15 Jul 2004. [S9] Unknown record type, unknown repository address, Wisconsin, Dane County, Town of Rutland; Page 137, Image 888, Line 2, Dwelling 980, Family 1017; Ancestry.com image 15 Jul 2004. [S2] Death - Obituary, Stoughton Hub, Friday, Aug 18, 1893, vol. VIII, No. 42; Page 5, Col. 3; Wisconsin Historical Library film P45-543; researched 02 Aug 2004. [S70] Unknown record type, unknown repository address, Wisconsin, Dane County, Town of Rutland, Page 11, Line 37; Image 533; Ancestry.com 15 Jul 2004. [S92] Unknown record type, unknown repository address, Wisconsin, Dane County, Rutland, SD #2, ED #87, Page 3, Image 311C; Ancestry.com 15 Jun 2004. [S94] Unknown name of person unknown record type, unknown repository, unknown repository address, Riverside Cemetery list; Stoughton Public Library; researched on 19 Jul 2004. [S9] Unknown record type, unknown repository address, Wisconsin, Dane County, Town of Rutland; Page 137, Image 888, Line 2 & 5, Dwelling 980, Family 1017; Ancestry.com image 15 Jul 2004. [S83] Unknown name of person unknown record type, unknown repository, unknown repository address, photograph dated 24 July 1994. [S120] Unknown name of person unknown record type, unknown repository, unknown repository address, http://www.arkivverket.no/ Kolbu in vestre Toten 1878-1894. [S120] Unknown name of person unknown record type, unknown repository, unknown repository address, http://www.arkivverket.no/ Kolbu in vestre Toten 1878-1894, Births p. 7. [S120] Unknown name of person unknown record type, unknown repository, unknown repository address, http://www.arkivverket.no/ Kolbu in Kolbu 1912-1926 p. 226 Item 0 [They were married in Gjøvik]. [S94] Unknown name of person unknown record type, unknown repository, unknown repository address, photograph dated 23 Sept 1999. [S94] Unknown name of person unknown record type, unknown repository, unknown repository address, Photograph taken 21 May 1992 New York trip. [S94] Unknown name of person unknown record type, unknown repository, unknown repository address, 23 Sep 1999 New York trip. [S113] Unknown record type, unknown repository address, New York, Otsego County, Town of Milford, Line 9, Dwelling 388, Family 419; Ancestry.com image 24 July 2004. [S113] Unknown record type, unknown repository address, New York, Otsego County, Town of Milford, Line 10, Dwelling 388, Family 419; Ancestry.com image 24 July 2004. [S113] Unknown record type, unknown repository address, New York, Otsego County, Town of Milford, Line 19, Dwelling 390, Family 421; Ancestry.com image 24 July 2004. [S175] Unknown author Edson Genealogy, Vol. 2 p. 679. �����Hannah R. Saxton married Harvey C. Jewell before 1828.1 As of before 1828,her married name was Jewell.